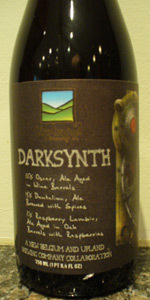 Darksynth is 50% New Belgium Oscar (ale aged in wine barrels), 40% Dantalion, and 10% raspberry lambic. Not bad. Balance of sugar and sour. Lots of over ripe raspberries. A - Poured into a Kate the Great tulip a super dark brown hue with a thin head that fades to leave light wisps. S - Aromas of bright acidic vinegar, nice raspberries faint wine barrel, light malts. Light toasty brown malts. T - Taste is similar to the nose, quite acidic and vinegar like, good raspberries. Nice caramel chocolate thing going on. Nice tart fruit combined with vinegar and darker malts. Quite tasty. M - Mouthfeel is nicely carbonated, not really flemmy with a nice sharpness. O - Overall this beer was rather solid, good sharp acidity with nice berry and darker flavours. Small fizzy head fares instantly, dark semi clear auburn mahogany color. Nose big tart sour funk, sour fruit, generic fruit, tart acidic lambic like funk, mild vinous notes and a berry like nice raspberry thing, faint red wine and buttery oak, oak dust, tangy. Taste is quite sour, tart fruit, little sour cherry note, little berry, fair raspberry jam and raspberry vinaigrette and generic lambic fruit, mild vinous too. Tons of acidity, mild flemmy, light buttery oak and a little red wine, vinous mixed with berry fruit. Finish very tart flemmy sour acidic esp on the back of the throat. Mouth is med bod, flemmy and very acidic, lighter carb. Overall pretty good, so Damn acidic, but nice fruit raspberry and vinous wine etc. awesome blend, i didnt even know this beer existed. for having only 10% raspberry beer blended in, it really tastes a lot like raspberries, tart and sweet and ripe and really authentic. the other main observation here for me is how sour it is, i mean, enamel peeling sour, so intense. it sort of looks and smells like a flanders red type, with the vinegar sourness and a dried fruitiness somewhere in the malt profile. lots of acid to this, citrus, lemons specifically in with the raspberries, and just a touch of chocolate malt type dryness. i love the funk, i love the musty wood on it, and overall this is really pretty excellent. i have not had any of the base beers blended to create this one, so its hard to say what each contributes, but the fruit is very forward and its a very complex drink. the surprise of the evening for me, in a session filled with a lot of world class beer. a real treat, pretty rare i assume, but grab one if you see it, delicious and some of the better work from new belgium in awhile. Thanks Sonny for sharing this. Tampa visit review dump, full notes on IPad during consumption. Bad bottle share review 1. A- Mahogany brown pour to a snifter with a small frothy light tan head. Fair retention down to a medium ring. Legs throughout but the beer seems slick and lace is rare. S- Raspberries and sourness. Lemon juice, funky must, vinous grapes, raisins and some toasted browned grains. Berry vinegar at times. T- Insanely sour at times between a lactic explosion and plenty of acetic at the end. Notes of fresh raspberries, floral, battery acid lemon juice, vinaigrette and sour vinous grapes. Feels like a true Oud Bruin with more lactic. MF- Dried out leading to a somewhat light feeling body. Carbonation is rather high revealing a foamy and oily creamy texture. Finishes hurting my mouth with insane sours. Man this is ridiculously sour with a barrage of lemons and raspberry fruit flavors. Vinegar and dark grain flavors make it feel like and Oud Bruin.